Sculptor Ray ‘Jake’ Jacobson died earlier this week. Services will be next Saturday, May 12, at Carleton’s Skinner Memorial Chapel, on the Carleton campus. Jacobson had been a vital member of Northfield’s art scene since 1955, when he began his teaching career at Carleton College. 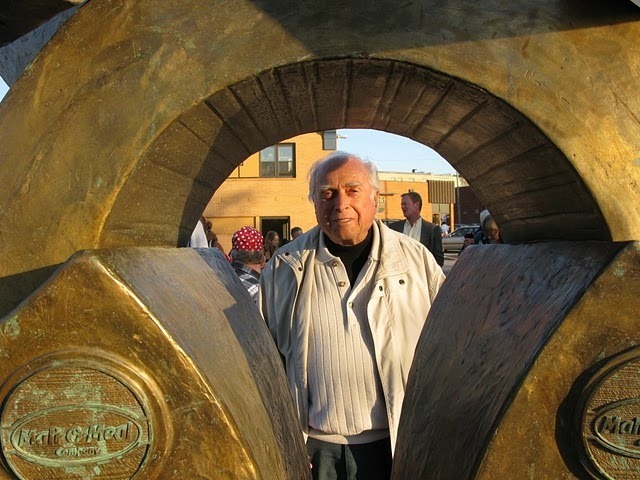 In addition to teaching art for more than three decades, he designed and constructed public art structures seen throughout Northfield, as well as Minnesota and beyond. See Dave Machacek’s ArtOrg slideshow that features Jake’s 10 public sculptures around Northfield. See all my Ray ‘Jake’ Jacobson blog posts and photo slideshows of his Northfield-related activities going back to Aug. of 2007. The memorial service will be held at 11am. Doors to the Chapel will open at 10am for a chance to visit with family members and friends to share memories of our dear friend. While most of how Jake is being remembered revolves around, and rightly so, his great and wonderful talent as an artist and teacher and the works of sculpture he has left for our and the next generations enjoyment, I have had the pleasure of living across the street from Jake for the past 28 years. When we built our home and moved to the street Jake and Jeanne named, we were immediately embraced, even though our appearance as a young couple with kids meant that the solitude of their quiet life on the gravel lane would not be the same as it had been. We couldn’t have picked better neighbors than Jeanne and Jake. What I will remember and miss are things like the late night grinding, hammering and the popping sound of the torch being turned off coming from his studio well into the night. I will miss him working on his never ending list of projects from planting new landscapes and building additions on his home to finding him on the roof repairing the stonework around the chimney with a huge Midwest thunderstorm fast approaching. I will miss Easter brunch in the courtyard and chats by the fireplace. He always wanted to know what we were up to, how the kids were doing, where they were and what they work working on. He made time for them and took a genuine interest in them and us. I will remember his epic battles with pocket gophers and moles and dandelions and creeping charlie. I will miss helping him heft some part of his next sculpture into place, the meticulous way he planned everything from his next major work down to building a to scale, cardboard mock-up of a valentine card (ok, I exaggerate) Being that particular I know it was difficult for him to give up control of the things he loved to do, from mowing the lawn to making sure the driveway was seal coated just right. But he did. While we all know he was a great artist, I want people to know that he was more than that. He was more than “Harvest” and the bridge square fountain. He was a young boy on the plains of Utah shaving his dog to look like a lion. He was a farmer and hunter and outdoorsman. He was WWII Helldiver pilot cocky and assured, a story teller, a husband and father and hiker and lover of beauty and peace and an ever curious person. He was also quite the dude and we will miss all of that even more than the silence of his hammer and torch.